I wrote a couple of days ago about how there seemed to be an increase in the number of fairy-tale/folklore influenced alternative comics while simultaneously there being a decline in the overwhelming importance of autobiography. While this is true, I'd still say that autobiographic is the most popular genre for alternative cartoonists. 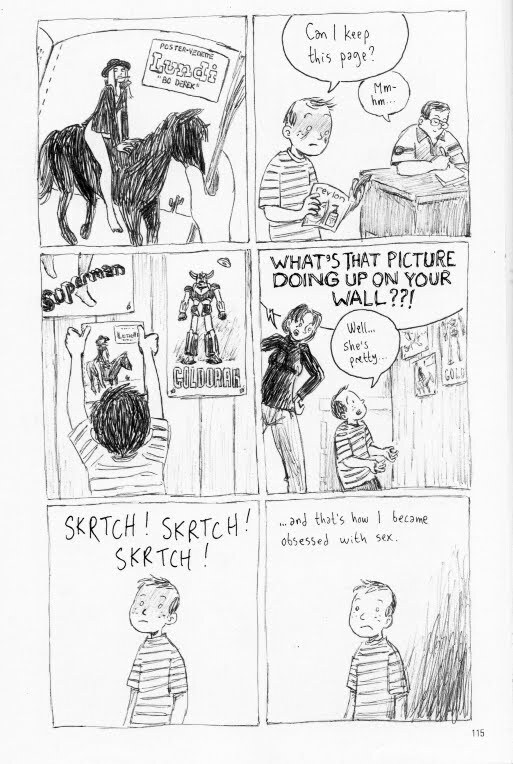 Furthermore, there is a backlog of autobiographical comics that until now haven't been collected. 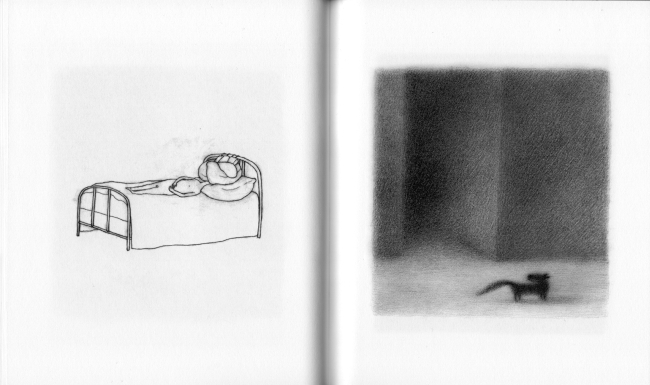 For example, Dennis Eichhorn has had two books of his work collected, but has hundreds of uncollected pages. And he was one of the most prominent autobiographers of the 90s. Suddenly Something Happened by Jimmy Beaulieu is of more recent vintage, but it still took a long time for this book to appear. The stories in it date from 2002 to 2006 (and the events depicted are even earlier). They're excellent, so why did it take so long? Simple--they were written in French. Beaulieu is a French-Canadian artist. The French-Canadian scene is one of the best in North America, but we anglophones only see a little bit of it--Julie Doucet, Guy Delisle and Michel Rabagliati are the best-known. (However, our English-language exposure to French-Canadian alternative comics dwarfs our exposure to Mexican alternative comics.) Until now, Drawn & Quarterly has been the main conduit into English for these cartoonists. 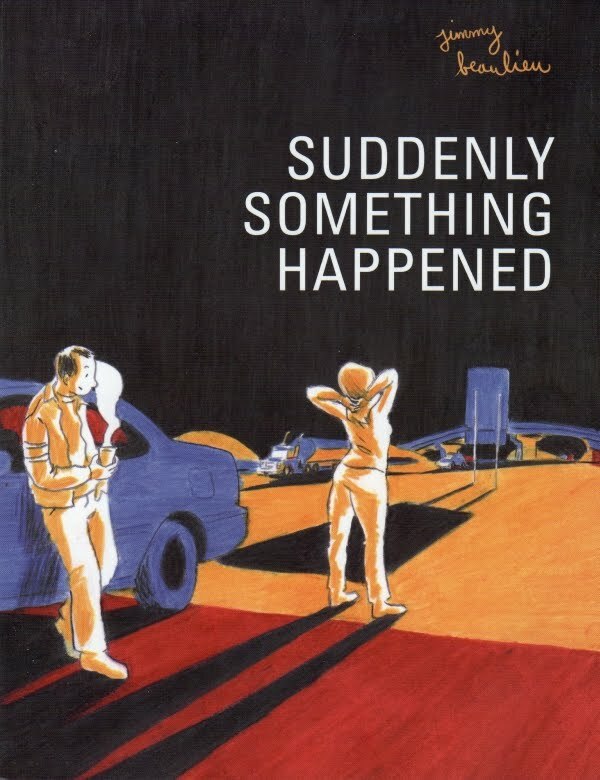 But Suddenly Something Happened was published by Conundrum Press with support from the Canada Council for the Arts and the government of Canada. So thank you, our moderately socialist neighbor to the north! Suddenly Something Happened is a thick (254 pages) book, but it flies by quickly when you read it. This is in part due to Beaulieu's sketchy, casual drawing style. It's not bold--indeed, it's primarily drawn in pencil. The first half of the book has grey tones added with marker (I think), but later on, he just relies on his trusty pencil to make all the marks on the page. I think we are seeing more comics artists willing to work with pencil only. Historically, comics have been "inked" to make them ready for reproduction. This was done because it was what turn of the 19th century technology required. Now we have scanners and digital cameras and computers, and inking isn't necessary. Some cartoonists use inking wonderfully as an expressive device--Jim Woodring, for example. But usually, I think cartoonists reflexively ink their work because it is the traditional way to do comics. Beaulieu dispenses with all that. It gives his work an immediate, diary-like quality which suits the subject well. The first half of the book is about Jimmy the single guy, surrounded by beautiful women and always missing his cues or else falling for the ones he can't have. You can see that Beaulieu likes to draw beautiful women. In this regard, he reminds me of Roy Crane--his appreciation for beautiful, fashionable contemporary women is as obvious as it was with Crane in the 1930s. The trick is to not be overtly sexual. Beaulieu's women are not fantasy objects, but characters. Like the girl who pops up just once in this little heartbreaker of a story. In a few short pages, Beaulieu takes us from a random flirtation, to a possible assignation with a prostitute, to a tragedy. It's moving and powerful. About halfway through the book, Jimmy meets Melissa who becomes his girlfriend. A trip to meet Jimmy's relatives is an opportunity for him to think about his childhood, and how he ended up the way he did. There's not much of a story arc here. Just the story of a young man getting older, finding love and companionship, and settling down. But Beaulieu uses this familiar material well. 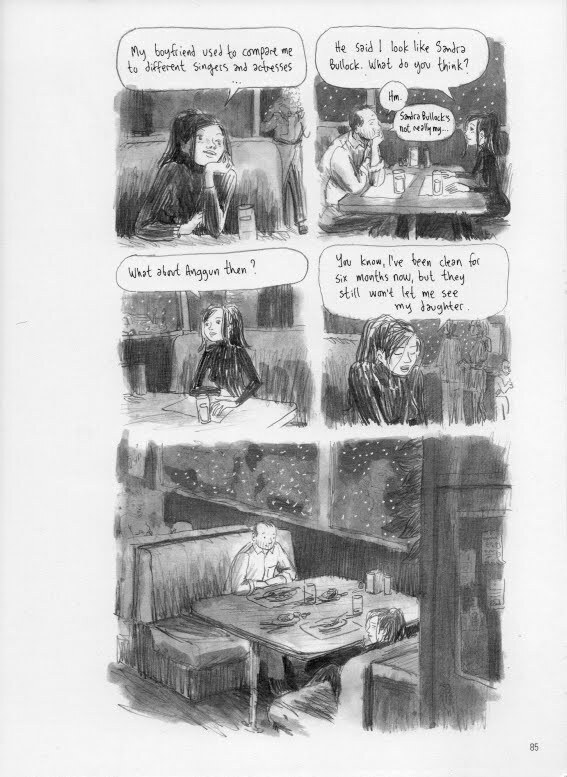 His work recalls Eddie Campbell's Alec, although Campbell includes more moments of high drama. It is interesting that they both work in a sketchy, hand-writerly drawing style. I include this page in the review because I love it. 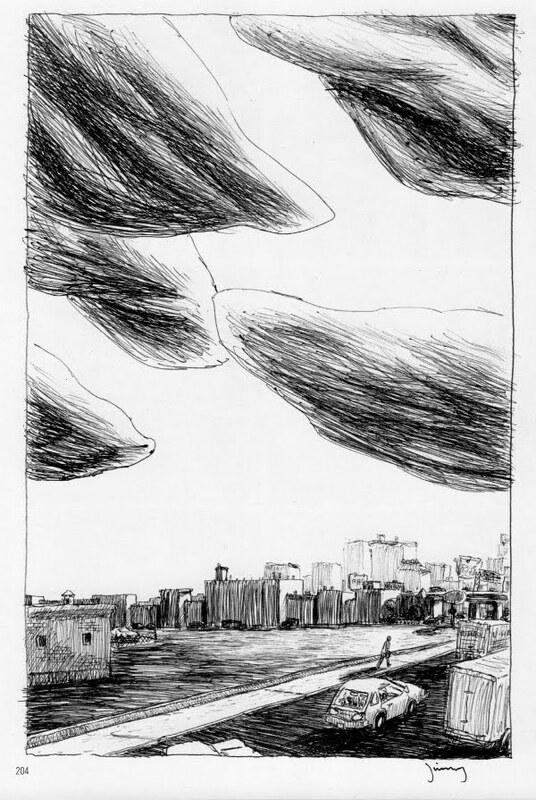 But also because it suggests to me that Lorenzo Mattotti might be an artistic influence. With a name like Renée French, you might expect this artist to actually be French or Franch-Canadian. But as far as I know, French is 100% American. 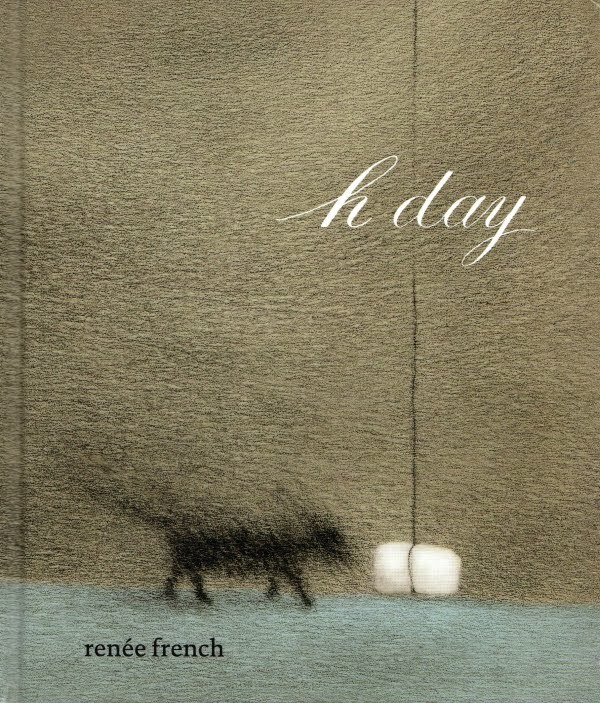 Not that there would be any translation issues in her latest book, h day (Picturebox). It is completely wordless. The book is structured as two parallel narratives. The left-hand pages generally feature a figure drawn against a white background. Things are happening to the figure's head. The back-cover copy says that the book deals with French's struggle with migraines, and the images on the left could be seen as visual metaphors for that condition. But if you didn't know that migraines were one of the subjects of the book, you still would likely interpret this as being about something bad happening in someone's head--mental illness, stroke, etc. The right side is a disjointed narrative of a city. 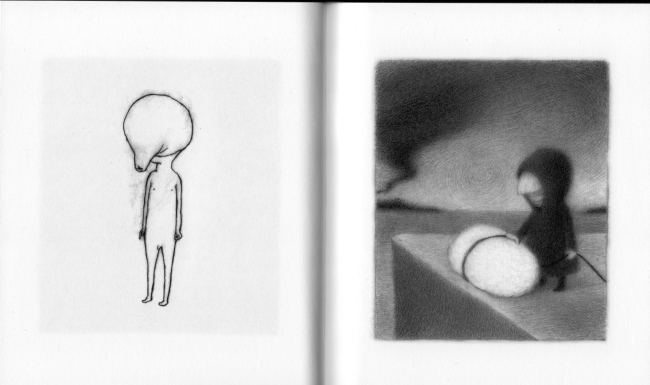 We see images of people, ants, and a dog, who we occasionally follow. But there are ruptures in this narrative. Occasionally, as in the spread above, the two narratives seem to match up in some way. But typically it isn't really possible to link them in any obvious way. h day's double narrative and concern with a head malady reminds me of Doris Lessing's Briefing for a Descent Into Hell. In it, the protagonist has had a serious mental breakdown and is now catatonic in a mental hospital. The double narrative is that we see what is happening in Charles Watkin's head--a bizarre series of dreamlike adventures--and what is happening in the hospital--two doctors arguing over which drugs with which to treat Watkins. Every time they change his drug regimen, Watkins' visions experience a drastic shift. As I read h day, I wondered if the ruptures in the "right hand" narrative also represented different stages or types of treatment for migraine. The dog in the right-hand narrative in some ways appears to be a standard issue city stray. It wanders about and encounters several dangerous situations. It goes outside of the city into the hilly countryside. And at one point, it is wrapped up in splints and bandages, becoming kind of a mummy dog. It wriggles free of its restraints, though. In the end, it enters a large square boat (an ark?) and sails away. I am loathe to try to interpret the dog symbolically. We are certainly meant to sympathize with it (it's cute! ), but at the same time, it leaves at the same time the migraine seems to go away. But even speculating like this risks oversimplifying it. I spoke of ruptures to the narrative. In one section, the right-hand narrative just stops, replaced by images of strange wicker objects. They are quite mysterious. This layer of inexplicability, of the uncanny, places this work in the same school as The Cage. And like The Cage, it has one image per page. 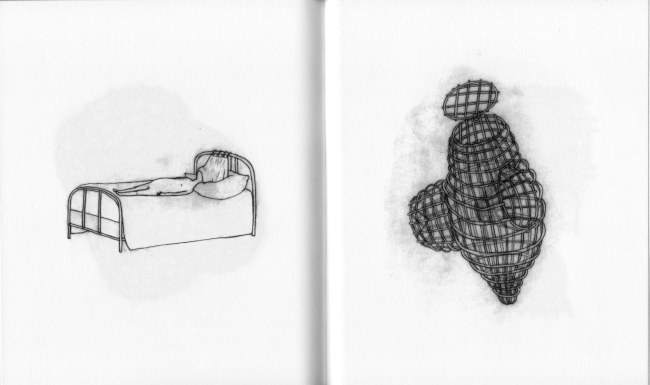 It seems superfluous to add at this point that the drawings are beautiful and quite powerful. h day is an incredible accomplishment.